The Hampta Pass trek begins in Manali. This adventure trail to Hampta Pass from Manali is exciting as it leads to enthralling meadows and green valleys. The trek across the River Rani further leads to Chika, Balu ka Ghera, and Shea Gahru, through a stretch of tall forests of oak and alpine, offering a totally spectacular view of the valley. These valleys are also home to abundant flora, speckled with colourful orchids and sprawling mountainous slopes of Himalayan cedar. The trek to Hampta Pass takes an idyllic route, through the placid and shimmering waters of the Chandrataal Lake, which is indeed a traveller's delight. The trek from Manali to Hampta Pass is rated easy to moderate on the difficulty scale and is recommended for most beginners and experienced trekkers, alike. This trek promises a thrilling and rousing adventure, spanning over 5 days. The most favourable times of the year for the Hampta trek are the months of May, June and from August through to December. Reach Manali and stay in a hotel and enjoy the day. There will be a short briefing in the evening by trek leader and team. Manali (2000 m) – Jobra (2707 m) – Chikha (3000 m) – Drive from Manali to Jobra where the trek begins – the trek from Jobra to Chikha will take around 2 hours. The team will drive to Jobra from Manali, which takes 45 minutes. Since Jobra is at a height of 2707 metres, at times, some of the beginners might experience mountain sickness. Necessary precautions and medication prior to travel could also be advised for beginners. Also, keeping oneself well hydrated is advised. Jobra is a place known for natural beauty lined by woody trails of maple, oak and deodar trees. A great view of the Rani Nallah flowing through the lush green meadows is a welcome sight to the trekkers here. From Jobra, the team begins the trek to reach Chikha, which takes about 2 hours. Chikha is known to be surrounded by glorious grasslands all around. Speckled by wildflowers, these grasslands offer a pleasant view. This is where the trek team camp by night on the first day of the trek. 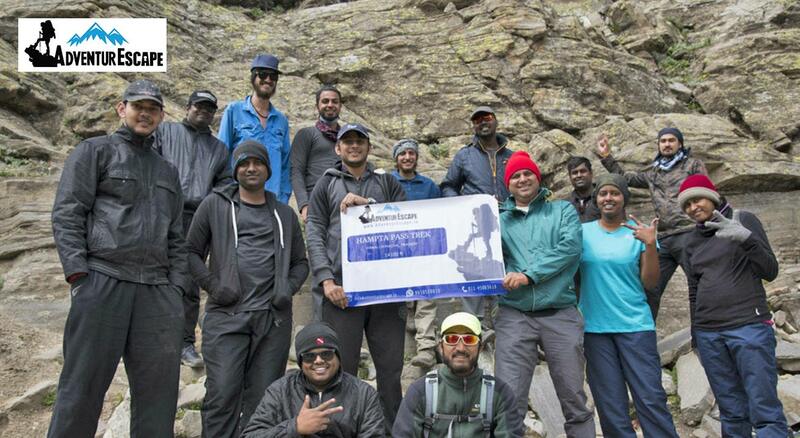 In the morning after breakfast, the trek team commences their onward journey from Chikha. They finally reach Bhalu Ka Ghera in 4 to 5 hours. This place, which is at an altitude of 3600 metres, offers picturesque views of the Dauladhar Range and the many majestic snow-capped peaks. The trek team stays at the camping site at Bhalu Ka Ghera overnight. Early morning after breakfast, the trek team prepares on a long hike, with their destination being the Shea Gahru via Hampta Pass at 4300 metres. This is perhaps the most challenging and exciting day of the trek. Finally, on reaching atop the Hampta Pass, the team feel triumphant, having reached their first high altitude pass(4300 m). The amazing views of the Chandra Valley and the awesomely beautiful barren mountains of Lahaul and Spiti present a spectacular sight here. They also get a glimpse of the lofty peaks of Deo Tibba and the Indrasan. The team further proceeds on a downhill journey to Shea Gahru, from Hampta Pass to the camping site which is at an altitude of 3700 m.
The team begins their onward trek from Shea Gahru to Chatru. Both these places, Shea Gahru and Chatru, are located by the Chandra River, within the Spiti Valley. They wear a deserted look and the barren terrain gives a totally different view of the valley. It takes about 3 to 4 hours to reach Chatru from Shea Gahru. Chatru is a confluence point of paths from Rohtang Pass, Hampta Pass, and Lahaul & Spiti. At Chatru, the trek team drives to Chandrataal Lake. They reach Chandrataal or the 'Moon lake' in 2 to 3 hours via Rohtang. The Chandrataal Lake offers an awesome view. The blue, placid waters of the lake wear a touch of pristine serenity. The trek team camp by the Chandrataal Lake overnight. This is the final day before they proceed back to Manali. On day 5, the final day of the trek, you can either leave for Chandrataal Lake which is situated 70 km from Chatru and will take approximately 2 hours depending on the weather condition. At Manali, the team begins their journey back to Delhi. With time on their hands, they might take up a short tour travel around Manali for some great views that the hill station offers before returning to Delhi. Accommodation costs (camping) sleeping bags, with roll on mattresses and the pantry/kitchen and toilet facilities. Qualified and experienced trek leaders, guide and support staff. All meals during the trek (veg and egg). Trekking shoes: Trekking shoes with good grip and ankle support is compulsory for the trek. Please ensure that the trekking shoes are not new and used by the trekker prior to the trek. The trail is slippery and requires you to walk through rocks and boulders so a good grip and water resistant shoes are necessary. Do keep an extra floater in case of rain and for use in camps. Cutlery: Carry a spoon, mug and a lunch box. It is insisted that trekkers get their own cutlery for hygiene reasons and for packed lunch. Collared shirts (3-4), full sleeves and quick dry so that it prevents sunburn on the arms and neck area. Poncho: Poncho is very important when you are trekking in the monsoon season to protect you from the rain. You can rent one from the organizer at INR 50 per day. Synthetic gloves for your hands, as it will protect your hands from water, snow, and keep you dry and warm. Moov spray (aches, & sprains). The nearest airport for Manali is Bhuntar, 50 km (approx) from Manali. Air India & Air Himalayas (9 seater, non-scheduled flight) have flights for Kullu. Air India has flights to Kullu from Delhi Airport & Air Himalayas operates flights from Chandigarh Airport. The two nearest railway stations for Manali are at Chandigarh (350 km) and Ambala (360 km). Onward journey can be travelled either by chartered taxis, buses or by air as Himalayan Bulls' private 8 seater charter is available between Chandigarh & Kullu. What is the type of accommodation provided in this trek and is it comfortable? All accommodation for trekkers will be in tents on triple sharing basis. Each trekker will be given a sleeping bag and will share tents with fellow trekkers which can withstand temperatures upto -10 degrees celsius. The organizers also have the option for double sharing/single sharing tents if they are not comfortable in sharing it with others but at an extra cost. Which are the best seasons for the Hampta Pass trek? What will the temperature be like during the months of June and October? Day temperatures in June/July at Hampta Pass go up to an average of 13°C-18°C. It may fall to 0°C and -5°C at nightfall. Temperatures in September and October will be slightly lower. Will I find snow on this trek? You will find snow on different parts of trail till early July. Once it rains, the snow melts away; hence, you’re unlikely to find it later in the season. The trek will start at 10 AM from Manali Bus Stand. Please be on time as it is a group departure and everyone will start sharp on time. In case you are late, you will have to take your own transport to Jobra. What happens if it rains during the trek? Carry a poncho with you and during rain; you will continue as scheduled using the poncho and backpack cover to protect you from the rain. The tents that you will be staying in, the dining tent, kitchen and toilet tents are all water proof, so you will stay dry inside. How will we get back to Manali? Chatru will be your last campsite. From here, the organizers will arrange for a vehicle to drop trekkers back to Manali. You can expect to reach Manali by 5 PM. The cost of transport from Prini to Jobra and Chatru to Manali is included in your trek fee. Will ponchos and other equipment be available for rent? The organizers will provide you with ponchos and trekking poles on rent from Manali. The cost will be INR 50 per person for each item. If not the Hampta Pass trek, what is a good alternative trek from Manali? There are treks like Bhrigu Lake and Chandrakhani Pass trek from Manali which are great alternative to Hampta Pass trek. Offloading your backpack will cost INR 1000 + 5% GST if you inform the organizers in advance. If you decide to offload once you reach Jobra, the amount will be Rs.350 per day inclusive of tax. The offloaded bag should not weigh more than 10 kg. Strollers, duffel bags, suitcases, etc. are not allowed.